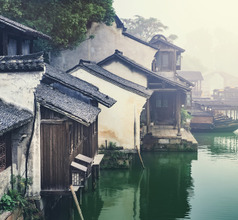 Wuzhen Water Town falls within the regular tourist circuit because it is a picturesque town with the Shi River flowing through it, ancient bridges and stone-paved alleys. 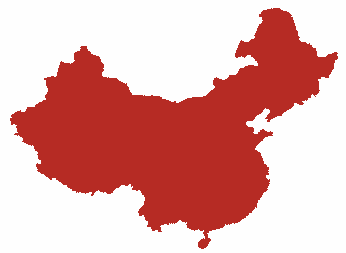 It lies in the center of the triangle formed by three well-known tourist destinations of Shanghai, Hangzhou, and Suzhou in the Zhejiang Province of China. 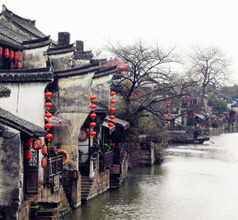 The water town looks like a page from a picture-book and draws countless domestic and overseas tourist all year round. 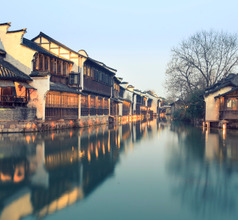 Wuzhen City is the perfect juxtaposition of ancient structures with modern facilities. 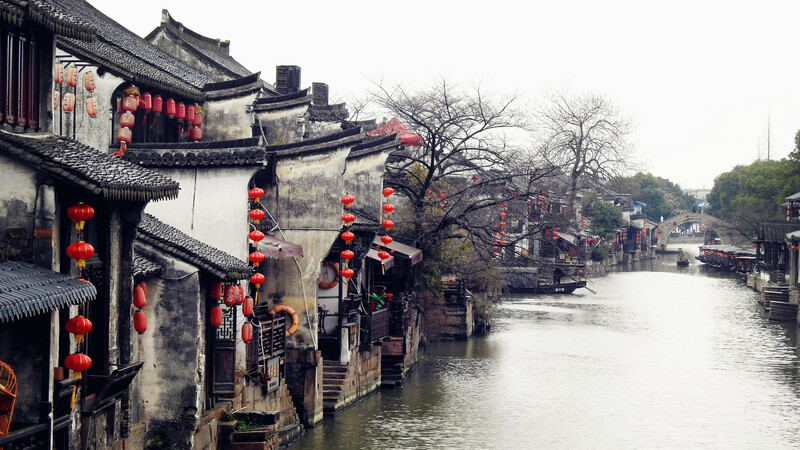 The buildings, bridges, and paved paths of the ancient water town were built about 1,300 years ago during the Qing Dynasty. On the other hand, there are many Western-style bars, spas, lounges, and cafes where expats, domestic tourists, and overseas tourists can spend a pleasant evening. 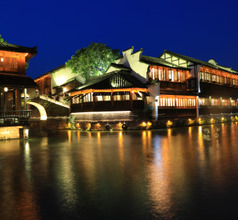 Wuzhen is well-known for its tea culture. The locals have perfected the method of making tea like a fine art. There are numerous teahouses along the alleys that are popular tourist spots because they provide the perfect vantage points to admire the town’s scenic beauty. A boat ride is also a very entertaining experience with an onboard martial arts demonstration and bamboo pole performance. 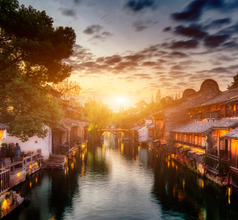 Although Wuzhen is usually referred to as an ancient town, it is packed with modern facilities considering a large number of domestic and overseas tourists that visit the town. The town has a few star hotels as well as charming ethnic-village-style boutique hotels with top amenities. There are low-priced hotels and guesthouses as well for those traveling on a limited budget. 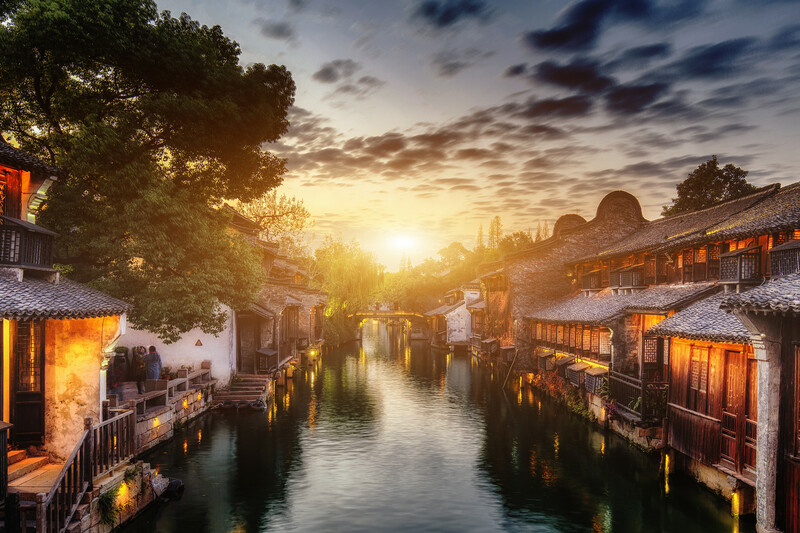 Tourists staying in the cities of Shanghai, Hangzhou, and Suzhou can conveniently make a pleasurable day’s trip to Wuzhen. 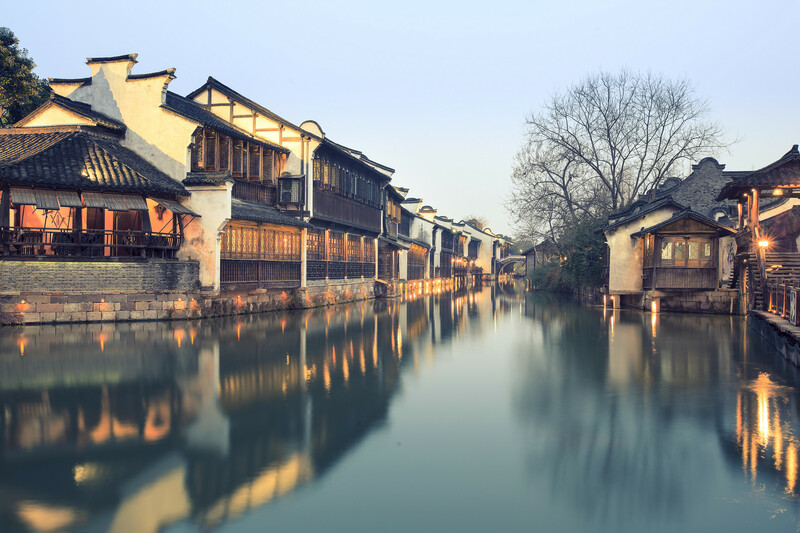 The East Scenic Zone is the most picturesque tourist spot in Wuzhen Water Town. The area has six beautiful ancient bridges that make perfect photographs. A number of the residences have been converted into restaurants or inns with in-house restaurants. Besides the admirable architecture, the East Scenic Zone also has many other tourist attractions. One of the most unique sites is the Ancient Bed Museum which has an exquisite collection of antique beds designed during the Ming Dynasty. The Folk Customs Museum had artifacts that showcase customs, weddings, birthdays, festivals, etc. that were celebrated by the local people during the 19th and 20th centuries. The blue-colored fabric of Wuzhen is very famous. It is beautifully woven and has lovely designs. The Indigo Fabric Workshop was established in the 13th century, and even today it is the major producer and distributor of Indigo-printed fabric. The West Scenic Zone, which is on the west of the Shi River is not as crowded with tourists as the East Zone although it has 72 ancient bridges. It also has countless Ming and Qing style buildings that have been converted into exhibition halls, historical sites, or hotels with varying tariffs. 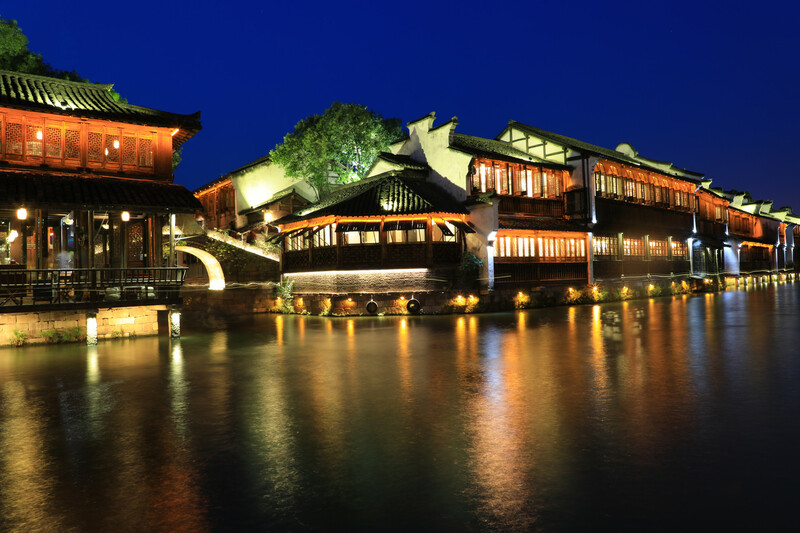 One of the popular attractions in the West Zone includes the Wuzhen Grand Theater where tourists can enjoy storytelling sessions, local operas, and classic old movies. The Yadi Silk Workshop is an interesting site where one can learn about the method of producing Chinese silk. The exhibits demonstrate the entire process of making silk, from planting the mulberry trees on which the silkworms feed to finally weaving the silk threads. Buying souvenirs in the Water Market (vendors on boats) is also a unique experience. 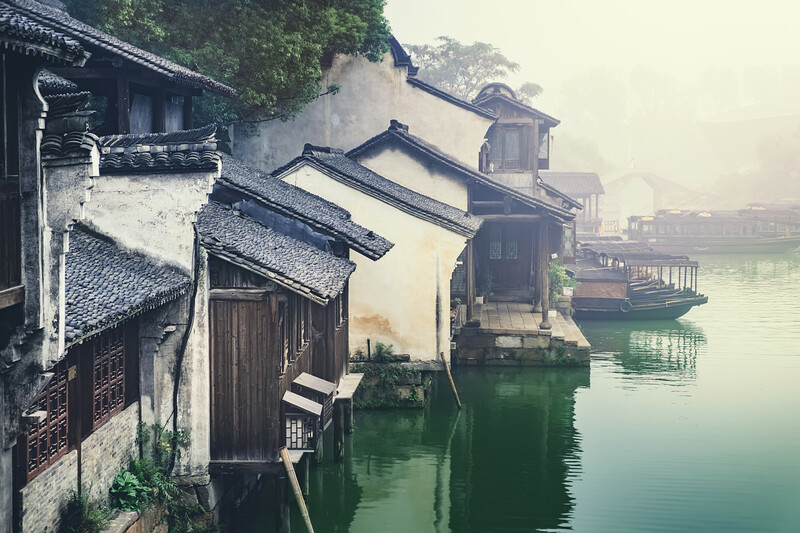 Considering its popularity with tourists from all parts of the world, the water town of Wuzhen has evolved into a semi-modern place. It has several Western-style restaurants so getting a cup of cappuccino and snacks will be easy. But the visit would be incomplete without visit one of the teahouses and trying out their aromatic tea and trying out their delicious cuisine. Some of their food specialties include crispy duck, braised lamb and noodles soup, wontons with meat, seafood or mushroom filling, braised mutton in brown sauce, Baishui boiled fish, Kaoru bean tea, Sisters-in-law cake, etc.